Global connected home security device market expected to reach USD 7.90 billion in 2021, growing at a CAGR of 18.3% between 2016 and 2021. A connected home is one in which different devices work interactively and information relevant to the residents/owner is accessed via high-speed broadband network. A connected home creates a local area network (LAN) throughout entire house, cable hookups, bringing multiple telephone jacks and standard outlets to every room in home. Technology has become increasingly sophisticated and growing demand for easy accessibility for connected homes is making market more attractive. Increasing demand of connected home fuel the demand for various security devices for connected home. Advancement in wireless standards, rapidly increased smartphone penetration and reduced hardware cost are the factors expected to boost the demand of security system for connected home in coming years. In addition, availability of well-positioned apps for operating different systems coupled with constant advent of new product with innovative technology is expected to fuel the growth of security devices for connected home market in forecast period. Furthermore, increase in the demand for home cloud technology is expected to impel the market potential for security device for connected home market. However, lack of awareness is expected to have adverse impact on growth of market in coming years. Nonetheless, technological advancement is expected to attract huge untapped area and likely to open new doors for the connected home security device market. Based on type, the global connected home security device market is bifurcated into detection devices, sensors, security camera, door locks, access control and others. 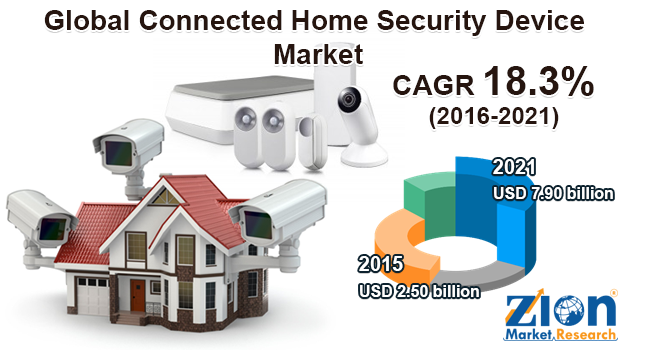 Security camera and door lock were two major leading segment of the global connected home security device market in terms of demand 2015. This segment is expected to continue its dominance for forecast period due to reduced hardware cost. North America was the largest market for connected home security devices due to the high technology adoption rate paired with better consumer awareness. Rising disposal income in countries like China, Japan and South Korea is projected to witness considerable growth over the forecast period in Asia Pacific region. Europe is expected to be one of the fastest growing regions in coming year. Western Europe is expected to experience significant growth for connected home security device market in coming years. Countries like South Africa, U.A.E., Saudi Arabia will show noteworthy growth in Middle East and Africa region. The key players operative in the global connected home security device market includes Essence, UTC / Interlogix , Tyco , GE, Honeywell, Hager Group Daitem Atral E-Nova, Google Nest , Apple , RISCO Group , Paradox , Philips Hue and Samsung amongst others.